These bright Cocinaware pots purchased at HEB should be fun and easier to use than covering baking dishes with aluminum foil. The cold weather just doesn’t want to give up this year, even here in southeast Texas, where the winter temperatures usually bounce around, chilling us to don our jackets and sweaters for a few days, then soon after, heating back up enough to coax us back into shorts. Since sometime around Thanksgiving many of the days have been grey and bleak with the highs just into the 50s, if that, and here we are. Tomorrow starts March, and my winter coat lays over the back of the rocking chair, just waiting to be grabbed as I head to work or out to walk a little black and white papillon. With all this cold, almost every weekend, I’ve put together a pot of soup or popped a roast with vegetables into the oven, making enough to divide into lunches to carry to work or for some quick leftover suppers. I’ve been making the roasts in glass baking dishes with aluminum foil as a cover. This works OK, but every time I start the cooking process, I’ve been longing for a dutch oven with a proper lid. I have two cast-iron pots, both of the famous French name, bought second-hand many years ago. 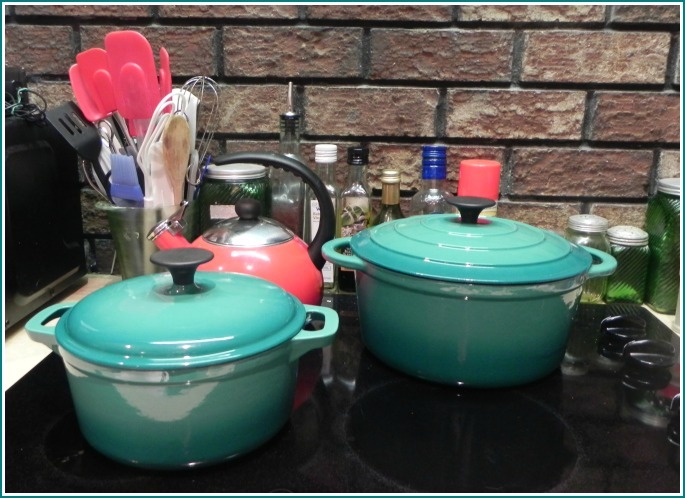 The large oval one has a lid and served me well to bake chickens and cook stews on the stovetop. With so much use, it’s become so pitted up and rusty that it’s now found a resting spot out in the garage, waiting to be put out for the next yard sale or maybe or to be an interesting planter. The other, a smaller yellow round pot, doesn’t have a lid, and none that I have seem to fit well. I haven’t been willing to put out the money for name-brand dutch ovens that I’ve seen at the department stores and the discount stores really didn’t have anything that really fit the bill. Today, I stopped off to do my weekend grocery shopping at an HEB, which is larger than the ones where I usually go. This store has a large kitchenware department, and right as I was passing by, my eyes lit upon some colorful dutch ovens and other cookware. The brand of HEB’s cookware is Cocinaware. The enamel-covered dutch ovens come in two sizes, 2.8 quarts and 5.2 quarts. I soon decided on a turquoise green, but was unsure of the size to buy. I wanted one that wasn’t so big; the smaller would be good for a roast and some veggies, but probably wouldn’t be big enough for pot of chili. In the end, just put both into my shopping cart. The price was right: $19 and some change for the small pot and just ten dollars more for the 5.2 quart pot. Together, the $50 for both was less than I had seen for any other single pot that I had seen in the store or online. With my other groceries, I picked up a pork roast and a couple of cans of sauerkraut, so that’s what’s in store for the trial run tomorrow. These dutch ovens are pretty and seem well-made. I don’t know if they’ll near as long as the second-hand ones that they are replacing. But I reckon they might. 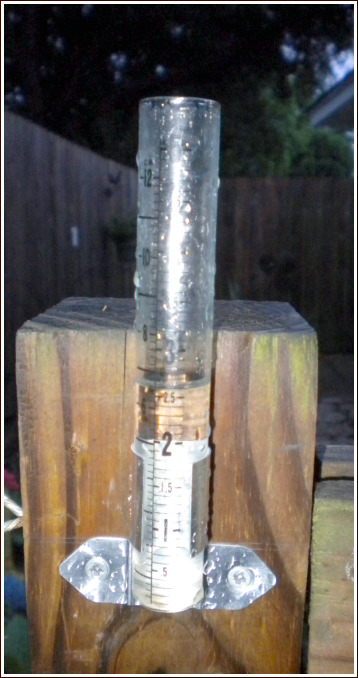 The garden rain gauge shows 1.8 inches, for a total of 2 inches in the past 24 hours (1/09/11). Annie barked at the bumps of thunder as I showered for work this morning. Then the .20 in the rain gauge gave evidence to some showers during the night which I hadn’t heard. However, the weatherman’s predictions weren’t enough so that I was still surprised by such darkness that I could barely see the other downtown building across the bayou from my office window. There was enough street flooding by 2:00 PM, and with the expectation of more rain to come that we were told to go home. Once the traffic loosened up and I had passed through a stretch of I-45 that was passable only in one lane, the rest of the drive was easy. Coming into my part of northwest Harris County, the grey clouds started to lighten and only intermittent drops hit the windshield. 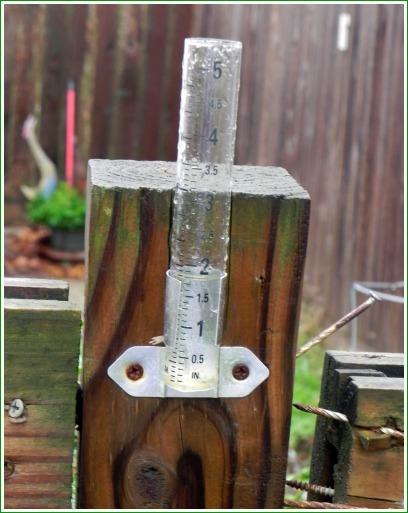 My rain gauge showed about 1.8 inches, and with the .20 I had tossed from the glass tube in the morning–a total of 2 inches. By looking around the yard and neighborhood, it seemed like we had gotten a good soaking rain–just what we need after the long dry spell of last year. We were fortunate not to get the 5, 6, and in some places 7 inches (as reported by the TV) that helped flood the roads and even rise into houses and apartments in some parts of the metropolitan area. Another magnificent jungle cactus bloom--just the thing to spark up a drab July. Here we are at the end of July, and this is only my second post of the month. Blame it on the heat. (“Don’t blame it on the bossa nova.“) It’s been that kind of month; one that has seemed to drag on, maybe because it has days in six different weeks. Our temps here in the Houston area haven’t been so far out of range, like in some places. However, they have been about 5-6 degrees hotter on most days than the low 90s that we usually have most summer days. Also, the spring and summer have been very dry this year. Now, though, the spotty, summertime showers that come in from the gulf seem to have returned. Here at my house, there has been some sort of shower each of the last four days. How much Tropical Storm Don has played in this, I don’t know, for, in general, that storm has been pretty much of a bust. Because of these recent showers, I finally remembered to replace my rain gauge. The previous one fit into that category: “they don’t make’m like they used to.” With the new glass tube in place, I can report that here near Huffmeister and 529, we had .20 of an inch of rain early this morning. Obviously, the plants respond to the rainwater much better than that out of the hose. However, I’ve kept the tomato plants alive, and if August doesn’t burn them up, they might produce some fall fruit. The plants in the flower beds and pots are holding their own for the most part. 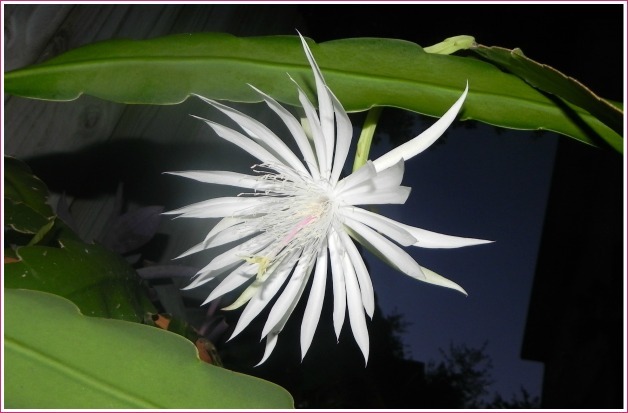 The July highlight was the second bloom ever on one of the jungles cactuses (epiphyllum). This time I saw the bud the evening before. I looked before I went to bed, but it still had not opened, but there in the morning, when Annie and I went out to the yard just before daybreak, there it was, fully opened. At that early hour, this bloom was still pristine, unlike the first one in June that was starting to wilt, as it was already becoming light when I discovered it. It’s such a pity that the life of these beautiful blooms is so fleeting. With all this heat, stay inside with the A.C. is about all one wants to do. It’s kind of like what winter forces upon people in some places. Anyway, it’s gotten me in the mood to start a new quilt, something I haven’t done in a long time. I’m piecing it by hand. I’ll do a bit of “show and tell” as it gets a bit further along. During my drive home last evening, the dark clouds only got more ominous on my Friday evening drive to the northwest. I was hoping to at least pick up my mail and get Annie outside before the rain started, but the first drops started coming down with a couple of miles still to go. There were just sprinkles coming down when I finally got into the house, but the thunder was already going and Annie had to be coaxed to go out evening after waiting so many hours. 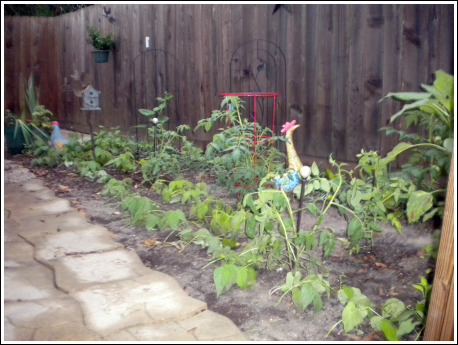 A garden and a rain guage go together like apple pie and ice cream! The garden was in somewhat of a disarray after so much rain pouring down heavily in a short period; however, nothing was really damaged that much. Most of the beans, which had been growing tall and gangly, had been pushed over and some of the leaves were matted into the muddy soil. A couple of the tomato plants also had to be righted again and restaked, but for the most part, everything looked happy to have real rainwater after nearly a month with nothing but the stuff from the hose. 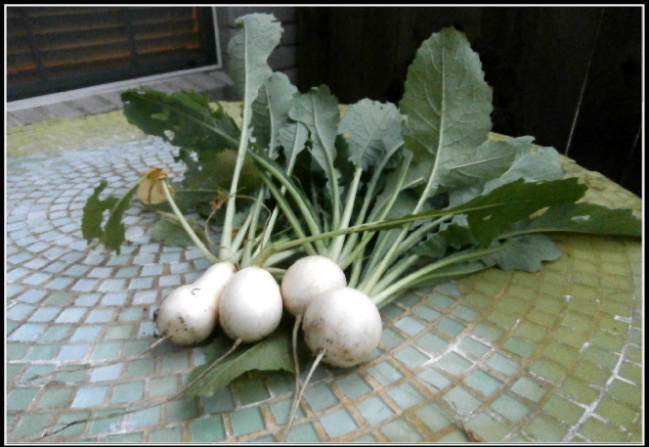 Though the garden is small and the soil not the best, I’ve already picked a few radishes, some green onions, and yesterday morning, the first tomato, which is from a plant that I had stuck into a container, before I had even thought about actually having a garden plot. Friday, May 21st: Partly sunny, with a high near 90. South wind between 5 and 10 mph. Friday Night: Partly cloudy, with a low around 74. South wind between 5 and 15 mph. Saturday: Mostly sunny, with a high near 90. South southeast wind between 5 and 15 mph. Saturday Night: Partly cloudy, with a low around 75. Monday Night: Partly cloudy, with a low around 70. 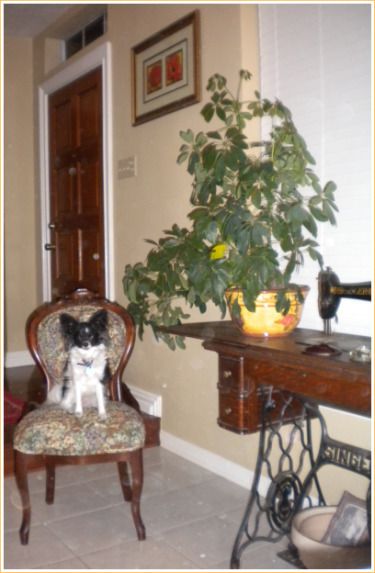 Annie posing, the schefflera plant I've raised from a $1 store twig, the old Singer that I rescued and have dragged around for years--all at my front door. Over the years I’ve experienced what I called (and I see that others call it the same)–the February Blues, a kind of down time after the holidays before spring comes out in full force. (It’s also known as S.A. D., or Seasonal Affective Disorder). I have to admit that living here in Texas it never has overcome me nearly as much or even for as long as it did when I lived in Kansas. I’m sure the warmer, brighter winter days have a lot to do with that. Warmth, for sure, might be the real reason because I remember some years in Kansas when it seemed like my feet froze in November and didn’t thaw out until mid April. I really just do not cold weather all that much. For me, the February Blues never have been something really depressive, because overall, I’m generally a pretty easy-going guy. I usually felt a kind of cloudy, blah feeling, sometimes triggered by something that had happened, like getting an unexpected bill or having a squabble with someone. And even though I say “February Blues”, the onset usually came sometime in January. That’s why I doubt any late winter gloominess will overtake me this year. I’m still “up” from moving into my house. There are so many new experiences, and even when the bills do arrive, they aren’t so unexpected that I can’t deal with them. I can’t walk into my living room with all it’s light and red accents and not feel good. John Edwards: he was my candidate almost up to the primaries. It seems like most of these big time politicians have to keep proving how great they are. I just don’t understand, though, why these politicians that get into all this trouble with women other than their wives don’t have more sense. Look at Ensign of Nevada and Sanford of South Carolina, even Clinton when he was in the White House. We’re not talking about guys in their teens or twenties who can only think with their hormones. I guess even Eisenhower had his mistress when he was the head honcho during World War II. Ted Haggard: It seems he no longer has homosexual compulsions. “Homosexual compulsions”–now what is that exactly? I’m trying to imagine it the other way. Craving meth and hookers has never been one of my urges. But now he’s cured. Right. How old is he anyway? Fifty-three going on fifty-four. People are pretty much who they are by that time. And don’t tell me his thing with Mike Jones was a rarity. Whether it’s Haggard getting it on with male prostitutes or politicians having affairs, they didn’t just start cheating on their wives when they were in their 40s or 50s. Guys just aren’t like that. Guys are creatures of habit. Guys like the routine. If they weren’t cheating in their 20s or 30s, they probably won’t be cheating later, no matter if they are straight or gay. Frankly, I don’t care what happens to any of them, but I do have more compassion for someone like Edwards than people like Haggard, Ensign, and Sanford, who have made such an issue about morality and preached, or in the cases of Ensign and Sanford, voted against gay people. But even these guys won’t bring me into any February funk, because I just found out that the expected freeze isn’t going to happen here, and I won’t have to drag my potted plants back into the garage from the patio for a third time this winter. And here are some cool suggestions for getting rid of the February Blues, besides getting a new house, that is. Merry Christmas to all! It’s almost noon here Christmas Eve Day in Kansas. No snow here but Annie and I tried to take a little walk down my sister’s street, but even though the both of us were bundled up, the bitter north wind with a temperature of 21 degrees chased us back inside within less than five minutes. My head was already aching from the cold. It doesn’t take much of this weather to remind me why I live in hot, humid Houston. The awful winter weather in the northeast part of the state will delay some of the family from arriving today. My nephew said they drove 6 miles to Lyndon and had to turn back home because the strong wind was blowing freezing rain, making the driving treachorous. However, we’re warm and toasty inside waiting for stew or soup or whatever my sister has on the stove for lunch. “Vegetable soup,” she says.